What is faith? What does “having faith” mean? Does it mean living in ignorant bliss? Passing through life thinking “God will take care of it”? Does it mean making your decisions solely on the belief that God will provide, protect, heal without giving thought to anything else? Does the employed not actively search for a job because he believes God will provide? Does the parent not discipline because he believes God will steer his children? Does the sick not get treatment because he believes God will heal? Where is the line drawn? The line between faith and reality? Travis’ and Carrie’s reality is that he is sick. He is really sick. This week they learned that MD Anderson does not have a “special sauce” just as Dr. Hamrick, aka Dr. Rockstar, told them at their first meeting. There is not a “miracle cure” being kept under wraps at the country’s best cancer hospital. There is not a miracle cure for Stage 4 Cholangiocarcinoma. I have faith Travis will be healed. Carrie knows Travis will be healed. She says that she can see him in 7 years running Hemma Concrete, doing God’s work, donating his time to a cancer foundation…living. And the doctors will be saying why is he still alive? But. We still think, KNOW, he should be treated. That’s a no brainer, right? But what about the decisions that are harder to make? Do some decisions mean your faith is weak? Somehow. Miraculously. Travis has to walk two lines. There is the faith line. He will walk this line because He believes God can, and will, heal him. God will intervene. There will be a miracle. Then. There is another line. The line of reality. The line that says you are very sick and your life is not going to end on your timetable. And as a responsible father and husband. Travis has to walk this line as well. What does this line look like? It’s buying and filling out birthday cards for your children for every birthday you may miss. It’s recording endless videos of yourself, with your children and wife, so they have tangible memories of you. It’s sitting down with the camera and telling your sons how to get the girl. And your daughter…to run from the boys. There is a sweet girl named Lily who lost her dad far too early and she has written down questions that she wished she knew about her dad…just for Travis. So Carrie is videoing Travis as he answers each of her questions. Who would he want to walk Pippi down the isle? What does he think each of his sweet children will be when they grow up? What is his favorite food, movie, band…??? He is doing it all because he has to walk that line. And just like starting chemotherapy next Thursday does not mean Travis does not have faith. Neither do these responsible acts of a loving and sick father. Travis is sick. Yesterday he and Carrie met with Dr. Shroff to review the results of his CT scan Wednesday. This CT scan provides a higher definition and better picture than the one he had a month ago when this all started in that emergency room in Birmingham, AL. And my friends found out there are not three tumors in Travis’ liver…there are eight. One large tumor approximately 6.7 cm and seven small “satellite” tumors scattered throughout his liver. Additionally, the lymph nodes in his chest are actually full of cancer. Not the “small amount” they originally thought. Are they glad they went to Houston? Yes! Do they like the news? No. Two things came out of Houston they are so grateful for. First, they found out that the treatment plan their doctor in Atlanta suggested, the doctor in charge of Travis’ care, is the same as the Cholangiocarcinoma expert. Second. They also are so grateful they will never have to say, if we only went to MD Anderson like everyone told us to do. And this trip was made possible by a friend. A new friend. A dear friend. Holden. Thanks to Holden, they will never look back with that regret. No regrets. While Travis is sick. Fighting for his life. He will have to walk two lines. There will be times he simply cannot walk both. Faith may dwindle. And that is where we, the body of believers, step in and fill the gap. Praying on his behalf when the reality line becomes too big to see past. When the faith line is so narrow it can’t be seen. Thankfully. God doesn’t require perfect faith to intervene. To give a miracle. God never relies on us. He knows He would always be disappointed. No. We have to rely on God. In the Bible, the book of John, chapter 11, describes Jesus raising Lazarus from the dead. In verse 40, Jesus says to Martha, “Didn’t I tell you that you would see God’s glory if you believe?” But the story doesn’t stop there. Jesus wasn’t laying out a requirement. He was providing a gentle reminder. How do I know? Because as soon as He says it, He prays, and goes ahead and raises Lazarus from the dead. Because Jesus knows. Sometimes it’s just too hard for us to walk both lines. If you know Travis you know his style. And you know he is known for his style. 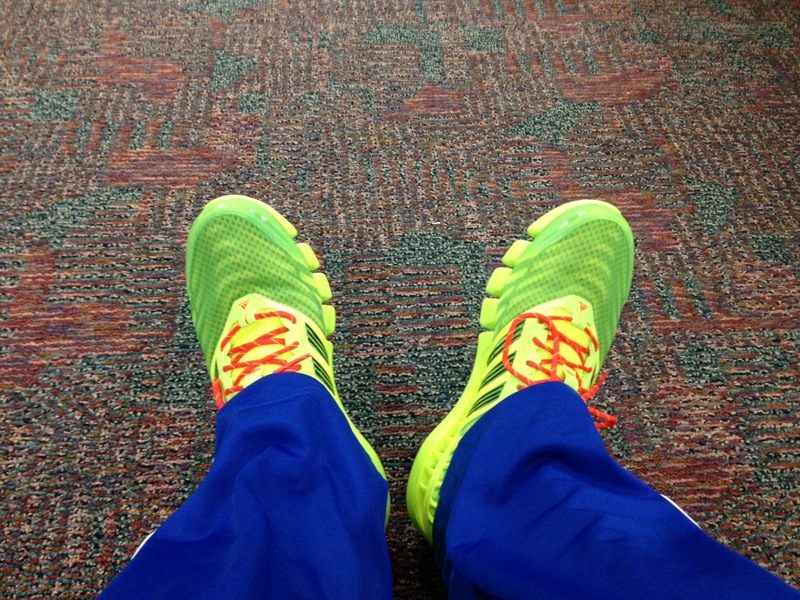 His clothes are as wild as his personality and his shoes…as loud. Kind of like these little gems. His recent purchase. His new “cancer kicks”. And you love him for it. Love him to the point that you take the fashion RISK of buying them in his honor. Wearing them in his honor. 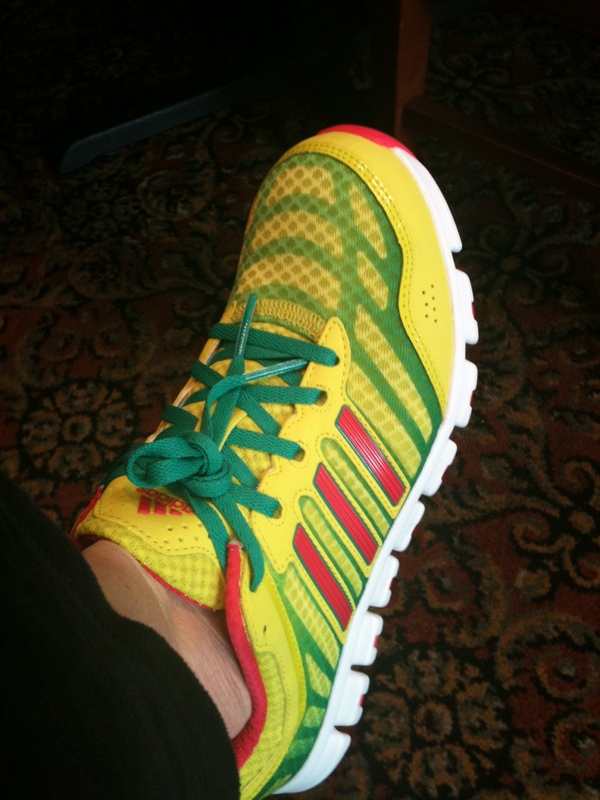 Friends like Steve Matheson and Charlie Cogen (aka The Chuckster) buy crazy shoes like this and send Travis pictures of them wearing them…just to make him feel better. Just to make him smile. Because that’s how much Travis is loved. So Travis just wants to say thanks. Thanks for all the love. The support. And introduce you to his new “cancer kicking” shoes. He bought them for this trip. For this FIGHT. And he is ready to fight. He now has…a plan. I am a faith person – I will believe to the point of people thinking I am an idiot!!! But I tell u this, I DO believe he will be healed!!! Having the lab tech read the results wrong isn’t much of a miracle….and I know God is gonna give us all a KABOOM miracle that forces the blind to see!!!! Not unto death….I believe it! Guess I’ve got a lot to learn about being a faith person. Anybody else? Yesterday, Carrie and Travis received confirmation that it is, in fact, Cholangiocarcinoma. They met with an expert, Dr. Shroff, (and I mean expert) in Cholangiocarcinoma. Cholangiocarcinoma and Pancreatic Cancer are the only things she works on. They could not have been in better hands so there is no more questioning if this is what Travis has. And yet. Travis and Carrie feel peace. Prayer Answered. Yesterday, Dr. Shroff sat and discussed treatment options with them in depth. There are so many treatment options. More than Travis and Carrie first realized. More than our “Google research” ever showed. Despite that, her suggestion aligned with the original suggestion that Dr. Hamrick, aka Dr. Rockstar, gave initially. She feels the best course of treatment, initially, would be to attack this cancer with two chemotherapies at once – Gemcitabine and Cysplatnum. Travis will be given chemo every two weeks for six hours. After two months they will reassess and determine their next course of action. Their next line of defense. It could be some kind of localized radiation such as Y-90 or Proton Therapy or another type of chemo treatment. So the treatment course is clear. There is no worry about making the “wrong decision”. There really is no decision to make. Prayer Answered. Dr. Shroff felt strongly about using the Gemcitabine and Cysplatnum together. She explained that their studies have shown that the Gemcitabine is far more effective when it is used in combination with Cysplatnum. So are you ready for the exciting part? They have only been using this combination for THREE years. So who knows if the scary stats on the Internet are even close to being accurate anymore! There seems to be advancements in treatment pointing to possible…survivors????? For the first time ever. MD Anderson is giving them options, and, there’s a little bit of tangible hope. Prayer Answered. And…the treatment prescribed. Can be done in Atlanta. Home. Travis getting treatment and sleeping in his own bed. With his family. Additionally, Carrie and Travis found out that MD Anderson would push for him to have Foundation 1 testing. Foundation 1 testing is an expensive, genetic testing that will show doctors which chemotherapy treatments your body is susceptible to. Scientists look at your DNA and look at where the gene is mutated and that tells them which specific chemo can attack it best. Sadly, many patients don’t get this. Either their doctor does not push for it, their insurance company won’t pay for it, or they cannot afford it. Your body can literally reject the chemotherapy and it will not fight the cancer. This test helps avoid that. What’s more is that Dr. Shroff stated that, because Travis’ cancer is so rare the Foundation will want it. So…if they can’t get it covered by insurance the Foundation will likely eat the cost. But what about all those scary statistics? What about those percentages? Don’t get me wrong. Cholangio is still a scary thing. And the percentages and numbers and expectancy doesn’t change. But. Dr. Shroff doesn’t see Travis as a number. Dr. Shroff sees him as an individual. And within just 30 minutes of meeting with Travis she was able to see him for who he is…a fighter. And SHE SAID….”I think you are an outlier.” Just. Like. Dr. Hamrick. The only way cholangiocarcinoma is ever cured is with surgery. But stage four patients are not eligible for surgery. Ever. Since first finding this out and seeing the stats between those who had surgery, and those who did not, Travis has been searching for a surgeon who would roll the dice on him. Who would take a chance. Because he knows that is his only chance. Yesterday…he found that surgeon. A conference call with a Piedmont Hospital suregeon at 5:00 gave Travis his first hope for surgery. But. Currently, Travis’ tumor is so large it is crossing between his right and left lobe in the liver. No surgeon in the world will touch that. He basically wouldn’t have a liver left if they did. So. We have to pray for the impossible. Pray that Travis’ body not only takes the chemotherapy but that it shrinks the tumor. This is a long shot for two reasons. First, cholangiocarcinoma does not usually respond to chemotherapy – which is why it is a “bad one”. Second, on the patients who do respond it typically does not shrink the tumor. It simply eats up the cancer but leaves the tumor “carcus” behind. We need it to get out of the left lobe. We need it to shrink. And then. Despite the odds. Despite the “rules”. The surgeon will consider surgery. I don’t know about you but I see God working in the Roberts life. He is answering prayers. Holding them in His mighty hand. Giving them peace. Standing with God, Travis and Carrie are ready to take on this beast. In their new “cancer kicks”. But once he started explaining what he meant…I got it. If you have been to Disney you know it is a “machine”. A well run machine. You never see landscapers…and yet the landscape is always perfect. The crowds are processed quickly and efficiently. They train their employees, from characters to the street sweeper, how to handle their guests politely and cheerfully and they refer to those workers as “cast members” instead of employees. They even figured out how to cut down the wait on the best rides with Fast Pass. They are a well run machine. Apparently…MD Anderson is as well. A cancer center that spans city blocks. Valet parkers at every corner to care for their patients. A check in process that is fast and efficient. But MD Anderson is not Disney. Because one thing is noticeably lacking…joy. A place where people don’t smile and nod as you pass by but, rather, look down at their feet…with tears in their eyes. Face after face after face shows sadness. Hopelessness. Fear. As you sit in the waiting room, scanning each patient’s face, you can’t help but read their thoughts…I’m dying. But not all patients were given a promise. More than once. This sickness is not unto death. You can call me crazy. Say I am in denial. Think that I have “false hope”. Look at me with sympathy. But I am standing on that promise. Let me be clear. I am a logical person. A legalistic person. I require explanations and they better be logical or I will call. You. Out. I argue with fellow believers about our beliefs – even when I agree with them. I play devil’s advocate. I sympathize with those who don’t believe and can often see their position. I am not a “faith person”. I’m ashamed to say it. Ashamed to admit it. I admire people who have a child like faith and can simply read or hear something…and believe. But that isn’t me. That is my struggle. And I have a feeling…many of you reading this are the same. And I have admitted to my dear friends. My best friends. That I stopped believing Travis would be healed. As “tidal wave” after “tidal wave” of disappointing news hit. I stopped hoping. And started thinking about…the inevitable. When I read the email from Kimberly, which I talked about in The Black Angel post,…I became a “faith person”. It’s hard. It doesn’t come naturally. But I believe God sent us a message, the same message, more than once. The pathology slides are in from Johns Hopkins. They were sent there to get a second opinion. We were hoping. Praying. That it was a misdiagnosis. That the original lab person had an “off” day and simply read the biopsy wrong. We were hoping God would answer our prayers this way. But He didn’t. Our ways are not His. Believe that with me. Please. Become a “faith person”. It’s scary. But wow. Is it ever exciting. In a Disneyland for dead people. As I have told you before…the faith and love of others has both amazed and overwhelmed Carrie and Travis. Travis, specifically, has never felt so much love. Dare I say…has never “felt” so much as these last few weeks. There is daily evidence of the love for Carrie and Travis. Right when they think they can not take another step in this journey. God shows up. Comments left on the blog stating they were praying for Travis even though the person does not know him. And then there was the call. Carrie’s friend Diane called her and asked her if they would be at the prayer service on Sunday. We do believe God can and will heal Travis. Not just because we want Him to. Not just because we asked Him to. Not just because Travis is a “good person”. Not just because Travis is a believer. Mothers and fathers of young children…die. Every. Day. To be honest. I don’t know why God sometimes chooses to heal and sometimes chooses not to. I know why bad things happen to good people. We live in a fallen world where there is sin, disease and death. But I don’t know why God doesn’t always choose to intervene. And…when I am honest…when my thoughts are quiet and it is just Him and I…I sometimes get mad about it. Especially when things didn’t go the way I thought they should go. When the people I deemed worthy are hurt and the people I deemed unworthy are spared. My thinking is wrong. I know it is. But it is true. And I also know I won’t have the answer to these questions this side of heaven. That’s ok. God doesn’t owe me an explanation. I don’t know what they are. But only for His holy reasons and for His holy purpose…God has told us Travis’ sickness is not unto death. So I believe he will be healed. At 3:00 today there will be a prayer service for Travis. Travis and Carrie will be there for it and will leave straight for the airport to head to MD Anderson after. It is short notice and, for most of you, it is a long drive. So, if you cannot make it, we are asking you to simply pray for Travis. From wherever you are. Regardless of whatever you are doing. Pray for him at 3:00. Pray for his healing. Pray for God to intervene. So that you don’t forget, set an alarm. Write yourself a note. Ask Siri to remind you. And watch how God shows up. Yesterday was the first opportunity the Roberts had to meet with a specialist in gastrointestinal cancers, specifically Cholangiocarcinoma. Someone who will help Carrie and Travis breathe again. Their appointment was at noon and the morning had been good. Records picked up. Kids dropped off. Business running smoothly. There was even some laughter. The drive to Emory was pretty to say the least. The mature trees and full azaleas were bursting with color against quaint cottages and impressive estates. It was almost…peaceful. And then the trees cleared. And as Emory appeared ahead, hearts started racing. Suddenly the peace and tranquility was gone. Suddenly stomachs were churning. Suddenly it was getting harder to breathe. Despite looking “dapper” (the physician assistant’s word…not mine) in his “baby blues” (pants) and polo with sleeves rolled up, Travis was…a wreck. The wait in the waiting room was three hours. At least it felt that way to Carrie and Travis. Finally, Amar’e Stoudemire, called Travis back. Ok. So it wasn’t Amar’e Stoudemire of the New York Knicks…but he was a dead ringer! Charm and wit are a big part of Travis’ personality. It is how he has been able to get away with the things he has gotten away with most of his life. Make them laugh and he gets whatever it is he wants. Doing what you know calms you. It helps you breathe. Being witty and charming calms Travis. Only…Amar’e Stoudemire didn’t exactly find Travis charming. Luckily he was only there for a few minutes. The doctor and physician assistant came in next and it wasn’t long before all of the oxygen got sucked out of the room. Nobody could breathe. Everybody was gasping for air. The doctor got right to the point, explained the clinical trial they had going on and asked if Travis had any questions. Any questions!?! Apparently, he didn’t know Travis. Travis went through a litany of questions and as each answer came the Roberts quickly realized this visit was going to be no different from the others. It wasn’t that the other doctors weren’t familiar cholangiocarcinoma. It wasn’t that Google was wrong. The Internet wasn’t this place with only worse case scenarios. It was that this disease is that bad. How long? That’s what everyone wants to know. How long do they have? The problem is cancer is different for everyone. It reacts differently to everyone. The treatments are different for everyone. So doctors talk in averages. Where did all of the oxygen in the room go? Why were the Roberts struggling to breathe?With tears in his eyes, Travis tried to catch his breath and then did what he does. And then he left. Most of us, in that situation, would have gone home. We would have turned off the lights, crawled into bed and cried. But not Travis. Travis got in his truck and drove 7 miles across town, put on a happy face, and walked into a room full of lawyers for a mediation between his company and a general contractor as if he wasn’t just handed a death sentence. Somehow. Travis figured out how to breathe. Yesterday was not the day the Roberts were hoping for…praying for. Yesterday did not make things any easier. But the good news is…there is always tomorrow. They will head to MD Anderson Sunday night for a three day visit. Their expectations are set. They know they are not going to suddenly hear about high success rates. About high survival rates. They are looking for a plan. The best plan. A plan to fight and beat the odds. There are two HUGE prayers that we ask you get on your knees for over the next 72 hours. First…pray for a mistake. Weird? Our prayer is that the liver biopsy reading was wrong. A mistake was made. Is it a long shot? Maybe. Maybe not. It happens. MD Anderson will be reading the slides. Pray that it is something. Anything else. Second…in order for them to find something different they need to get the slides. The slides are in transit. They are not there yet. They need to get there by Tuesday in order to be read in time for Carrie and Travis to discuss treatment options with the doctors at MD Anderson. Please fervently pray for both of these things. Every night Travis practices dying. If you know Travis, when you are finished laughing, you won’t be surprised by this. To hear him tell it is hilarious despite its morbidity. I am happy to report that I am still employed. Travis did not fire me. After all, he respects a little rebellion.